In microscopy (and other disciplines) the concept of standard two-dimensional (2D) digital images, as composed of many pixels with data about colors and intensities, is extended to 3D. A collection of 2D slices acquired along an axis, close to each other build the 3D representation of an object. Thus every pixel in a slice represents the light intensity collected from a small volume: pixels become voxels. A volume (3D) image represents a physical quantity as a function of three spatial coordinates. In a digital volume image, each sample (voxel) represents this quantity measured at a specific location. The image is made by a spatial sequence of 2D slices that include the object of interest. A slice is represented as an image matrix of pixels (X and Y coordinates). The slice number indicates the Z-coordinate. But not any collection of 2D stacks is a 3D image: see 3D Microscope. 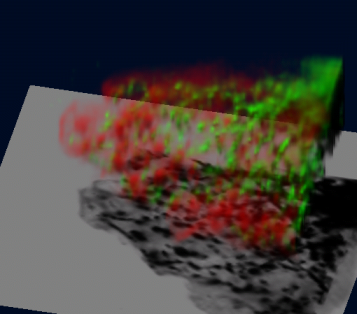 The above 2D image is a Volume Visualization of a 3D dataset rendered with Free SFP. See 3D.